According to recent a News 24 article, one in every three young South Africans has experienced some form of abuse in their life. The scale of this problem is shocking! 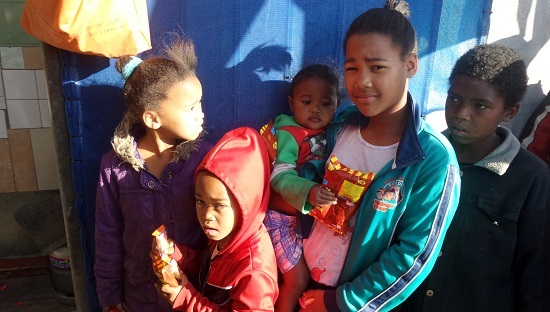 NGOs such as Solomon’s Haven in Mitchell’s Plain, Cape Town exists to address the problem of child abuse in the community and offer affected children with a place of safety where they are given a chance to heal. Established in 2001, founder Maria Solomons was determined to offer support to abused children after she found out that her child’s friends were being abused by their father. The shelter currently cares for around 20 children who not only receive the counselling they desperately need, but are also equipped with the necessary education and skills to prepare them for their future and to develop them intellectually, socially, emotionally and spiritually. FoodForward SA is proud to be able to assist such worthy organisations by supplying them with enough food to provide their children with well-balanced meals to keep them healthy and to help them grow. Due to the ample amount of food donations Solomon’s Haven receives, they are also able to run a soup kitchen catering to around 250 people on a regular basis. “We no longer have to worry about food shortages and can offer a great menu to our children. We’re also able to save thousands of Rands that would otherwise be spent on purchasing food”, said Maria. Maria is proud to share one of her success stories. Sizwe Nzimande arrived at the shelter at just three years old and after years of counselling and receiving loads of love and support, she grew to become a responsible member of society. Today she is a manager at a reputable accommodation lodge. In 2003, Maria Solomons was nominated as a finalist in the Cape Times Woman of Worth Competition and in 2004 she received the award. This made her even more determined to continue helping abused, abandoned and neglected children and is known in the community as the voice of the voiceless.